CONSTRUCTION UNTIL FURTHER NOTICE!!! THANK YOU FOR YOUR LOVE AND SUPPORT!!! Explore wellness with filipino cuisine this year! In partnership with Alliance of Filipinos for Immigrant Rights & Empowerment (AFIRE), Usapang Pagkain explores how Filipino food can best serve our community through free, monthly events. The event series resists the notion of Filipino food as incompatible with healthy living. It is a response to the dearth of culturally-relevant health education and the epidemic of cardiovascular disease and diabetes in our community. Usapang Pagkain will bring generations of Chicagoland Filipinos together to share our stories with one another and collectively learn practices that center our health, community, and food. Each event will highlight a Filipino dish or dishes, including recipes. Specifically organized to provide a much-needed community space for dialogue on health and wellness, Usapang Pagkain will examine the importance and potential of Filipino food in nourishing our body and soul. you're invited to "adapting filipino classics" on wednesday, may 23 from 6 to 8 pm. Samples of the featured recipes will be served. All are welcome and the event is free. AFIRE and our Usapang Pagkain event series is housed at the HANA Center at 4300 N. California Ave. in Chicago. Thank you, agyamanakapo, to all who participated in “Bahay kubo,” featuring recipes using vegetables -- all vegetarian! : kare kare, kulawo (burnt coconut cream). Unless noted, all events are free to the public and will take place at the HANA Center (4300 N. California Ave. in Chicago). Schedule and venues are subject to change. Please check afirechicago.org and filipino.kitchen for the most up-to-date information. Read more in our press release and view and share our event series on Facebook. One day, we will confront and help overcome anti Blackness, anti Indigenous and the self hate that comes from the colonized mentality. We will show up for our neighbors in struggles are not only linked but are indeed the same. We will praise these bodies we are in. We will give ourselves the cure and healing we so richly deserve, with full generosity. Chef Carlo Lamagna is a Philippine born, Detroit raised, CIA- and Chicago-trained chef, mastermind behind the pop-up dinner series, Twisted Filipino; and chef-owner of the eponymous, fully Kickstarter funded, soon-to-open Portland, Oregon restaurant, Magna. This is the story of Carlo's journey from good to great, in seven dishes. Thanks for coming to Kultura Festival 2017! 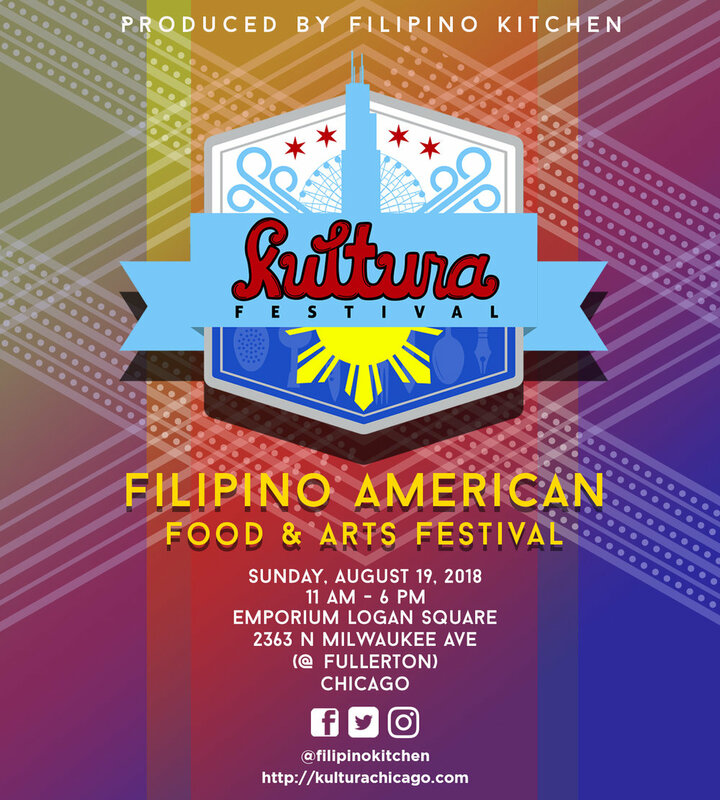 Started in 2015 by food media and events group Filipino Kitchen, Kultura Festival aims to highlight the best in Filipino American food and arts, and is carefully curated to appeal to those who personally identify with Filipino culture and the merely curious or uninitiated. Kultura Festival coincides with the start of Filipino American History Month, a nationally commemorated holiday every October since 2009, with the passage of US House Resolution 780 and Senate Resolution 298. Check out Kultura Festival 2017: Chefs & the festival menu, DJs, performers, Lechon Lectures, and more! Thanks to the Chicago tribune, WBEZ, yas on the lifestyle network/the filipino channel, and newsy for covering kultura Festival!